Contains Arginine for Improved Ammonia Metabolism. No Phenylalanine and Low in Methionine, to Reduce Risk of Hepatic Damage and Encephalopathy. A High Ratio of Branch-Chain Amino Acids (BCAA) to Aromatic Amino Acids (AAA). Medium-Chain (MCT) and Long-Chain (LCT) Triglycerides for Improved Fat Digestion and Absorption. 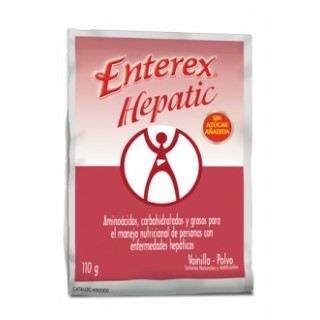 Enterex Hepatic is specially formulated to help promote positive nitrogen balance and improve the nutritional status of individuals with liver disease while minimizing the risk of hepatic encephalopathy. A high ratio of Branched-Chain Amino Acids (BCAA) to Aromatic Amino Acids (AAA). (32:1 molar ratio). No added sugar or simple carbohydrates, for improved glycemic control. Low in electrolytes for management of edema.